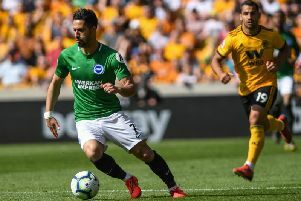 Brighton will look to bounce back from their opening day defeat at Watford when they battle Manchester United in their first Amex outing of the season on Sunday. The Red Devils pipped Leicester to victory in the Premier League opener last Friday, while the Seagulls slumped to a 2-0 defeat. Albion secured Premier League survival with a 1-0 victory over United at the end of last season. What time does Brighton v Manchester United kick off? Kick-off for Albion's first game at the Amex will be at 4pm on Sunday due to Sky Sports' coverage. It will be the first of two TV games in a row, as the Seagulls travel to Liverpool next weekend on BT Sport. Yes. Sky Sports announced last month that Albion v Manchester Utd will feature as part of their Super Sunday coverage. The match will be preceded by champions Manchester City v Huddersfield, which will be displayed on the concourse for fans in attendance. With skipper Bruno being forced off in the first half against Watford with a hamstring injury, the Spaniard looks to be a doubt, which could pave the way for ex-Barcelona man Martin Montoya to make his Albion debut. Yves Bissouma also impressed after coming on at Vicarage Road, so he could be pushing for a starting place along with Iranian World Cup star Alireza Jahanbahsh. Belgian striker Romelu Lukaku started on the bench for United against Leicester, so could come into contention to start at the Amex. Ex-Albion loanee Jesse Lingard could also come into contention after missing their opening-day win. Summer signing Diogo Dalot was set to return to full training this week but Sunday's game could be too soon for the right-back. Nemanja Matic and Antonio Valencia are also set to miss out through injury. Kevin Friend will be the man in the middle on Sunday, with Stuart Burt and Matthew Wilkes his assistants. Graham Scott is the fourth official. Manchester United are favourites to extend their winning start to the season at 3/4 on SkyBet, while Albion are priced at 4/1 to win, with the draw 5/2. United talisman Romelu Lukaku is favourite to score first with odds of 7/2, while attacking duo Alexis Sanchez and Marcus Rashford are both being priced at 9/2. Albion's top goalscorer from last season Glenn Murray is most likely to score first for Albion according to the betting company, who are offering odds of 11/2. Odds are drastically reduced for Murray to score anytime in 90 minutes, with odds of 2/1. Pascal Gross is priced at 9/2 and a Jahanbakhsh home debut goal is 9/2.